Puffy Club Sandwiches - these were a HUGE hit! Took them to a party and they flew off the plate! Can make ahead of time and freeze for later. 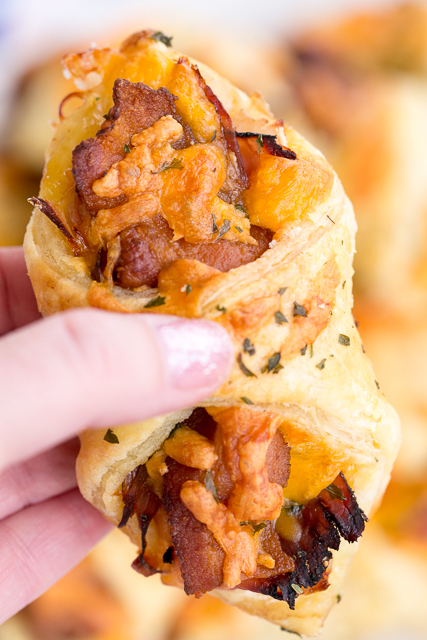 Puff pastry topped with honey mustard, ham, turkey, roast beef, bacon and cheddar cheese. I'm going to double the recipe next time. We just love this easy hot sandwich recipe!! This weekend my college football team has their A-Day game. It is the spring practice game. For me, the game isn't the main attraction. I love getting together with all of our football friends and tailgating. It has been WAY too long since we've seen everyone and had some fun tailgate food. These Puffy Club Sandwiches are definitely going on the menu. They are really, really good. 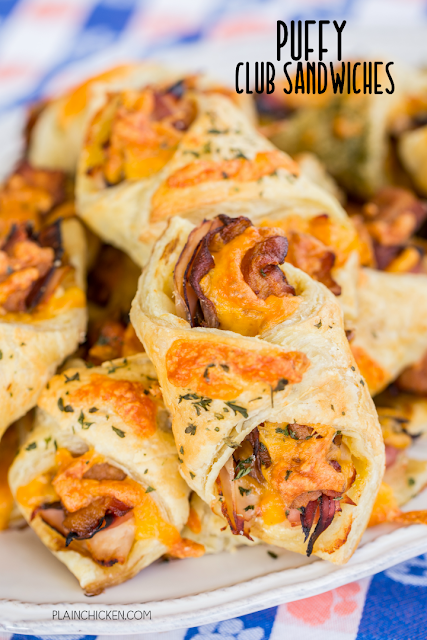 We ate them for lunch last week and I knew they would be perfect for the A-Day game party. These sandwiches can be assembled ahead of time and frozen for later. They taste great warm or at room temperature. Perfect for a party! I used ham, turkey, roast beef and bacon for the club sandwich meats. If you don't like one or any of those, just swap it out for your favorites. It will still be delicious!! Happy Spring Football everyone! Let the countdown to kick-off begin!! Preheat oven to 400. Line baking sheets with parchment paper. Set aside. Spread about 1/2 tsp of honey over the puff pastry. Arrange ham, turkey and roast beef down center of the pastry squares. Top deli meat with half slice of precooked bacon and cheese. Fold two opposite corners of each square over the filling and press edges to seal. Place on prepared baking sheet. Combine egg and water. Brush each pastry with egg wash. Sprinkle with parsley.